The Shure SM58 is Shure's most popular Cardioid Dynamic Microphone for live and studio use. Consistently the first choice of performers arou.. The Shure SM58 is Shure's most popular Cardioid Dynamic Microphone for live and studio use. Consistently the first choice of performers around the globe, the SM58 mic is a genuine world standard and a true vocal legend. By design, the Shure SM58 is the perfect all-round vocal microphone with a dynamic capsule and cardioid polar pickup pattern. Minimising feedback and improve on-axis pickup response, the SM58 does a great job in removing unwanted noise from exterior sources such as on-stage monitors or wedges and ensuring your vocals are as pronounced as possible. A tailored frequency response ensures that a wide range of vocal styles and timbres are clear and detailed no matter what the environment. Its rugged construction, internal shock mount system and steel mesh grille will guarantee consistent performance years down the line. 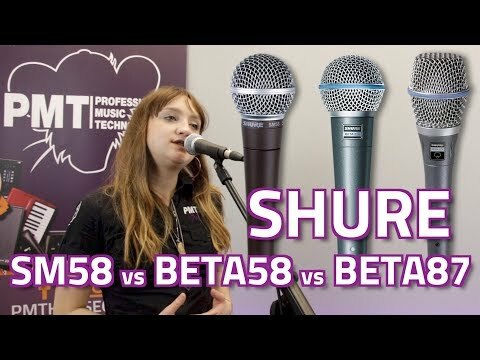 If you need a microphone to last, look no further than a Shure SM58. Shure have paid homage to the legendary SM58 with a new 'SM58 50th Anniversary Edition' - available here at PMT whilst stocks last.